Southern Organizing: Following the Mt. Olive Pickle boycott, in 2004 FLOC won a collective bargaining agreement with the North Carolina Grower’s Association, which covers nearly 7,000 H2A workers all across North Carolina. Each year we are able to resolve hundreds of questions and complaints regarding wages, health and safety concerns, housing issues, and more. Read more about how we work with our members to solve problems. 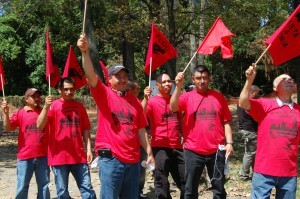 Mexico Organizing: Many of FLOC’s members are from Mexico and travel back and forth each year. Organizing doesn’t just happen while our members are in the US, it continues in their home towns in Mexico through local meetings and national training each year. Check out the great work our members are doing in Mexico. Midwest Organizing: Following an eight year campaign and boycott, FLOC won a collective bargaining agreement covering workers on tomato farms across Ohio which sell their product to Campbell’s Soup. Read more about this historic victory and how conditions have improved in Ohio labor camps and fields.